Mr. Game & Watch is a 2D character meant to serve as the mascot of the Game & Watch Gallery games and the Game & Watch handheld systems. 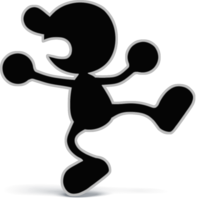 Mr. Game & Watch is not a character from any of the Game & Watch titles, instead being created as a playable character for Super Smash Bros. Melee to represent the Game & Watch line. His appearance seems to be based on the generic people in Fire and Parachute. The Item Shopkeeper sprites in Wario Land 4. In Wario Land 4, a character that is very similar to Mr. Game & Watch appears as the Item Shopkeeper. She is an alternate form of the Black Cat's (which is additionally Princess Shokora in her feline form) and serves as the shopkeeper of the Item Shop. She also appears as pictures on the walls of the level Hall of Hieroglyphs. A notable difference between Mr. Game & Watch and the Item Shopkeeper is that the shopkeeper has eyes. Walks onto the battlefield in Game & Watch frames. Mr. Game & Watch makes his character debut in Super Smash Bros. Melee as the final unlockable character. He can be unlocked by playing 1000 Melee matches, beating Classic or Adventure mode with every other character, or by clearing Target Test with every other character. Afterward, the player must defeat Mr. Game & Watch on Flat Zone to unlock him. In All-Star mode, the Mr. Game and Watch team is always the final enemy stage. Here, the player must beat twenty-five Mr. Game & Watches. Mr. Game & Watch is unique in that his movements are individual frames like with a Game & Watch game. All of his "voice" clips (including screams, taunts, and other such noises) are also sounds heard during various Game & Watch titles. Mr. Game & Watch is portrayed as one of the lightest characters in the game thanks to his flat appearance, heavier than only Pichu and tied with Jigglypuff, which makes him easier to KO, and his attacks, while powerful, are slow. However, his movement attributes including dash, walk, fall, fast-fall speeds, traction, and gravity are identical to Mario's. All of Mr. Game & Watch's moves also reference the various Game & Watch units. His standard special is Chef, which tosses food from a frying pan. His down special is Oil Panic, which absorbs projectiles in a bucket that can be dumped onto opponents to deal a combined damage total. His up special is Fire, which springs him into the air with a trampoline. His side special is Judge, which has Mr. Game & Watch swing a hammer, its effects based on the number he holds up. His standard attack is based on Greenhouse, and his dash attack has him wearing the helmet from Helmet. For his strong attacks, Mr. Game & Watch's forward strong attack is the chair from Lion, his down strong move has him flip a manhole cover from Manhole, and his up strong attack is the flag from Flagman. His neutral aerial is the parachute from Parachute, his forward aerial is a package from Mario Bros., his back aerial is a turtle from Turtle Bridge, his up aerial is based on Spitball Sparky, and his down aerial is a key from Donkey Kong Jr.. His side smash is the torch from Fire Attack, his up smash has him wearing the helmet from Octopus, and his down smash is the hammers from Vermin. All four of his throwing animations have him juggling the character like in Ball. His taunt has him ring a bell, based on the alarm feature of Game & Watch units. Mr. Game & Watch returns in Super Smash Bros. Brawl, as an unlockable character. He can be unlocked by playing 250 Brawl matches, clearing Target Smash!! with 30 characters on any difficulty, or having him join the party in The Subspace Emissary; with either of the former methods, he must be defeated on Flat Zone 2 to be unlocked. While he has been made heavier, he is still the second lightest character in the game (now only heavier than Jigglypuff and tied with Squirtle). In terms of his moveset, his neutral aerial has been replaced with the fishbowl from Tropical Fish, as the parachute is now a part of his up special move. His Final Smash is Octopus, which transforms Mr. Game & Watch into the giant octopus from the Game & Watch unit Octopus. The Shadow Bugs' trophy information explains that Mr. Game & Watch's body can endlessly produce them. 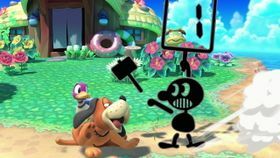 Tabuu took note of the unique qualities of Mr. Game & Watch's body and uses him to create Shadow Bugs, which in turn are used to build up the Subspace Army. Mr. Game & Watch allows this to happen as he does not understand the concepts of good or evil. When Meta Knight, Snake, and Lucario reach the bridge of the Halberd, they find it being controlled by several copies of Mr. Game & Watch. Snake knocks out all the Mr. Game & Watches out of an open window and into the ship's main deck, where the Shadow Bugs merge into Duon. Following the foe's defeat, the real Mr. Game & Watch's trophy is left behind. Fox attempts to shoot it but Princess Peach revives it and scolds him, but gives Mr. Game & Watch her Parasol to cheer him up. Mr. Game & Watch appears alongside the other characters to confront Tabuu at the Entrance to Subspace, but along with the others is reverted back into a Trophy by his Off Waves. He is later revived by Luigi, Ness, and King Dedede to fight Tabuu at the center of The Great Maze. Mr. Game & Watch is the only major character to not have a snapshot. Mr. Game & Watch reappears in Super Smash Bros. for Nintendo 3DS and Super Smash Bros. for Wii U as an unlockable character. In Super Smash Bros. for Nintendo 3DS, he can be unlocked by playing 90 Smash matches or by clearing Classic mode 10 times, and must be defeated on Flat Zone 2. In Super Smash Bros. for Wii U, he can be unlocked by either playing 80 Smash matches or by clearing Classic mode on Intensity 2.0 or higher with five characters, and must then be defeated on Flat Zone X. His inclusion in the game was briefly hinted at in Pac-Man's reveal trailer, where at the end of the video, the screen compares the debut years between him, Pac-Man, Mario and Donkey Kong. 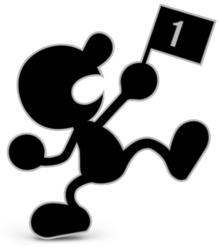 His debut year is technically incorrect, because Mr. Game & Watch did not exist as a character until Super Smash Bros. Melee, and his Super Smash Bros. Brawl trophy description considers his debut to be 2002's Game & Watch Gallery. Despite being hinted at in the trailer, he wasn't officially confirmed to be in the game until its release, and was not officially revealed until afterward. Mr. Game & Watch's appearance has been altered a bit, which includes having a smaller nose, and more rounded hands, as well as being smaller in size. While his moveset is unchanged from Super Smash Bros. Brawl, there are minor differences in his looks when performing certain moves. He is also given a new down taunt in which he sits down and sighs, based on Mario Bros. In terms of customizations, Mr. Game & Watch is the only fighter who can be equipped with the Torch, Watch Battery, and Microchip equipment. 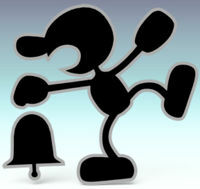 Mr. Game & Watch makes a reappearance as an unlockable playable character in Super Smash Bros. Ultimate. In this installment, every time he uses a move, his appearance changes to reflect the graphics from the respective game from which the move originates. Additionally, when Mr. Game & Watch throws an opponent, they turn into their stock icon in his juggling animation from Ball. 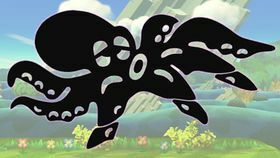 His Final Smash has also been altered somewhat; after Mr. Game & Watch turns into Octopus, he grabs opponents and takes them off of the screen, rather than attacking them with arms. Prior to the game's release, controversy arose surrounding a move animation used by Mr. Game & Watch, which featured a stereotypical depiction of a Native American that was based off the 1982 Game & Watch title, Fire Attack. Nintendo has responded by stating that it will issue a patch post-launch to replace the animation with a simpler one. Mario, Luigi Free-for-All Mario Bros. Ground Theme - Super Mario Bros. Chef is Mr. Game & Watch's standard special move, based upon the Game & Watch unit Chef released in 1981. Mr. Game & Watch tosses food with a frying pan that deals damage if it hits. Up to five pieces of food can be tossed, while pressing the button repeatedly causes food to be tossed out faster. Opponents can also be hit by the frying pan, which deals fire damage. In Super Smash Bros. for Nintendo 3DS / Wii U, players can unlock two custom variants for this move, like with all other special moves. The first custom variant for Chef is XXL Chef, which tosses out larger food at a slower pace that deals more damage but doesn't travel as far. The second is Short-Order Chef (Fast-Food Chef in PAL releases), which only tosses out smaller pieces of food at a faster pace and a lower angle, giving the move more range but dealing less damage. In Super Smash Bros. Melee, Mr. Game & Watch only tosses sausages while using this move. In Super Smash Bros. Brawl onward, he can toss shrimp, fish, and steak in addition to sausages, though the additional foods are aesthetic only. 1 A very weak hit that does not inflict flinching or knockback, and inflicts 12% damage to the user. 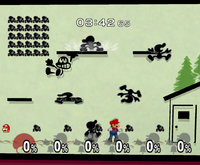 3 Similar to the Fan's attack, as it launches the opponent towards Mr. Game & Watch. 4 Inflicts a slashing attack that launches opponents diagonally. 5 Produces four electrical charges that zap the opponent, making them rise slightly. 6 Deals flame damage and threatens recovering opponents, it has the second strongest knockback of all Judge attacks. 7 Deals moderate knockback. 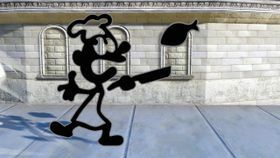 If the attack connects and Mr. Game & Watch is on the ground, a food item will appear in reference to the number 7 being associated with luck. 8 Freezes the opponent and has weak vertical knockback. 9 Deals massive knockback, intended to resemble the effect of the Home-Run Bat. Can KO at single-digit damage percentages in some cases. It also has the strongest knockback of all Judge attacks. Extreme Judge only picks numbers 1 and 9. Getting a 1 causes Mr. Game & Watch to take 5% damage, while a 9 delivers a high knockback attack, but the attack offers less knockback than getting a 9 with the default Judge. Chain Judge removes all the extra effects that are used with the default Judge. The attack instead deals hits equal to the number that's picked, with higher numbers offering stronger knockback with their final hits. Fire is Mr. Game & Watch's up special move. Based on Fire first released in 1980, a pair of firefighters briefly appear on both sides of Mr. Game & Watch to propel him into the air with their trampoline; in Super Smash Bros. Brawl, the firemen also slightly push any nearby opponents away. In Super Smash Bros. Melee, Mr. Game & Watch simply falls back toward ground after the jump, while in Super Smash Bros. Brawl onward his parachute neutral aerial move in the previous game is part of this move instead, automatically deploying once Game & Watch reaches the peak of the jump. The parachute can be retracted by attacking or pressing down on the control stick, while holding left or right allows the player to control Mr. Game & Watch's horizontal movement. Unlike most up special moves, Mr. Game & Watch is not left helpless afterwards, and thus is able to attack, but he cannot use this move again until he lands on the ground. In Super Smash Bros. for Nintendo 3DS / Wii U, the first custom variant for this move is Heavy Trampoline, which deals increased damage on the way up but does not give Mr. Game & Watch as high of a jump and only hits during the start of the jump. 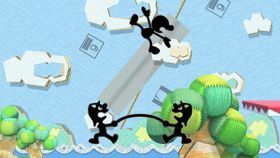 The second variant, Trampoline Launch, sends Mr. Game & Watch an increased distance into the air but does not give him a parachute; the move also launches anyone else nearby. Oil Panic is Mr. Game & Watch's down special move, based on Oil Panic released in 1982. When used, Mr. Game & Watch pulls out a bucket in front of him and can absorb any energy-based projectiles (such as PK Flash or a Ray Gun shot) into the bucket. If this move is used after three attacks are absorbed, Mr. Game & Watch throws out the oil in his bucket which has extreme damage and knockback, determined by adding up how much damage each of the projectiles absorbed would have done. The oil splash can also be enough to one-hit KO if it has absorbed three projectiles that are strong. Oil Panic's first custom variant in Super Smash Bros. for Nintendo 3DS / Wii U is Efficient Panic, where the bucket only requires one projectile, but the splash deals less damage. The second variant is Panic Overload, with the bucket having a smaller absorption range, but the splash is larger. Octopus is Mr. Game & Watch's Final Smash. When used, Mr. Game & Watch transforms into the Octopus from the Game & Watch game Octopus. While he can move in this state, he can still only move like a normal character; he is able to move around across the ground and jump, and can fall off the stage. Octopus damages any opponents that make contact with it, and pressing the attack buttons causes the tentacles to extend, which gives it more range to hit others. The front side of the octopus deals more damage than the back. In Super Smash Bros. Ultimate, the Final Smash is no longer controlled by the player. 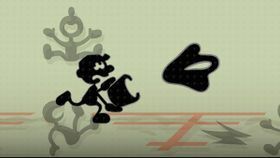 After transforming, Mr. Game & Watch automatically moves forward, grabbing any opponents in his way and dragging them towards the right side of the screen, instantly KO'ing them. Mr. Game & Watch then reverts to his regular form at the position he initiated the Final Smash. In Super Smash Bros. for Nintendo 3DS / Wii U, the Octopus has a rainbow-colored outline, similar to the glow a character has after collecting a Smash Ball. In Game & Watch Gallery 4, Mr. Game & Watch, along with Mario, hosts the Gift Mode in the Gallery Corner. This is his only speaking role. Mr. Game & Watch makes cameos on the menus of WarioWare: Twisted! and in the 'Games' icon in the character selection screen in WarioWare: Touched! Several audiences in The Invent-Off stage cutscenes from WarioWare: Smooth Moves resemble Mr. Game & Watch people. He also appears in the microgames that are based on the Game & Watch games. Mr. Game & Watch like people appear in WarioWare, Inc.: Mega Party Game$! in the multiplayer game Survival Fever, they cheer for the players, and will say "1,2,3!" when a microgame is about to start, they will cheer more if the player(s) beat the microgame, but if they fail they will boo the player and some will leave. In WarioWare Gold, multiple Mr. Game & Watch-like figures appear on the large-screen television in the League Arena microgame modes when the player wins or loses a microgame. Mr. Game & Watches in WarioWare, Inc.: Mega Party Game$! The icon of Mr. Game & Watch in WarioWare: Touched! Mr. Game & Watch's cameo in Donkey Kong Country Returns. In Donkey Kong Country Returns and its Nintendo 3DS remake, Mr. Game & Watch makes a cameo appearance in the background of Foggy Fumes. He is seen hammering a pipe. In Super Mario Maker, there is an unlockable costume for Costume Mario that looks like Mr. Game & Watch. It is unlocked by scanning a Mr. Game & Watch amiibo or unlocked randomly by clearing 100 Mario Challenge on Expert setting. Pressing will make Mr. Game & Watch take out his bell. He also takes out a parachute from Parachute after jumping. In Super Mario Odyssey, a silhouette of Mr. Game & Watch wearing a hat appears on minigame icons. GB Game & Watch Gallery The monochrome hero of the Game & Watch series, a fellow who oozes personality. First appearing in 1980, the series were the original portable game systems. The first games in the series were quite simple, but as time passed, technology evolved. The multiscreen series featured game play on dual screens. As the name states, the games also kept time. Wii Super Smash Bros. Brawl Mr. Game & Watch's Final Smash. He turns into the huge cephalopod that made its debut in the Game & Watch game Octopus. Of course, you can damage enemies by running into them, but you can do more damage by pressing the attack button to extend four arms and launch foes. In the original Octopus game, you had to avoid the octopus while salvaging treasure from the sea. Snake: Otacon, there's a guy walking around in here...and he's only got two dimensions! Otacon: That's Mr. Game & Watch. He comes from a world where everything is flat. Game & Watch was a series of portable games released by Nintendo in 1980. They were powered by large-scale integrated circuits and only had mono-chrome LCD displays, so characters kinda looked like the numbers on a calculator. The guy you're looking at now, Mr. Game & Watch, was a character who appeared in these games. Snake: This is making my head hurt. Otacon: Well, um... He's... I mean... Look, just start fighting him, and I'm sure everything will make sense. G&W Game & Watch (04/1980) Game & Watch was first released in 1980, making the series the father of the Game Boy and Nintendo DS. Or maybe an older sibling? Anyway...in Smash Bros., Mr. Game & Watch uses distinct retro moves to damage his foes. However, he's only two dimensional, so he's pretty easy to send flying. Game & Watch was a series of handheld video games that started in 1980, before even the Game Boy. In this game, you can play as the guy who starred in them, moving about in his quirky, oh-so-retro little way. He can string together some pretty powerful attacks but, unfortunately, being 2D makes him very easy to launch. G&W Game & Watch (04/1980) Mr. Game & Watch's Oil Panic special catches shots and turns them into oil. After catching three, the bucket will be full and you'll be able to throw oil all over your enemies. Some shots, like Samus's fully powered Charge Shot, will fill the bucket in one go! Throwing the oil you get from a shot like that can KO your foes in a flash! N/A The Game & Watch title Octopus featured a hero collecting treasure while avoiding a bothersome giant octopus's tentacles. Activate Mr. Game & Watch's Final Smash to transform into that octopus! Ram into opponents, and use the attack button to extend the tentacles. The only thing you can't do is change the direction you're facing. Pit: Hey, it's a Shadow Bug! Palutena: No, that's just Mr. Game & Watch. Viridi: Watch out for number nine. Pit. Pit: Uh, what are you talking about? Palutena: Mr. Game & Watch's Judge attack displays random numbers. And when it displays "9," the attack is devastating. Viridi: Getting hit with a nine will knock out any fighter with a single strike, no matter who it is. When his back is against the wall, Mr. Game & Watch might try his luck with a Judge attack. Pit: Leaving victory up to luck doesn't seem like the best strategy. Palutena: Well, luck is part of every victory. Viridi: So you'd better watch yourself, Pit. This monochrome, two-dimensional hero represents the handheld Game & Watch series, first released in 1980. More recently, Mr. Game & Watch can be found using his retro fighting moves to battle foes in the Super Smash Bros. series of games. Although he generally has a 2D appearance, Mr. Game & Watch's model is actually a 3D model flattened to give the impression that he is a 2D character. Mr. Game & Watch is the only character in Super Smash Bros. Melee whose All-Star trophy isn't affected by the background lighting, which is shown with most trophies. Moreover, Mr. Game & Watch is the only character in Super Smash Bros. Melee whose All-Star trophy doesn't display him in an alternate coloration. When turned into metal by a Metal Box, Mr. Game & Watch will still make beeping noises when attacking, moving around, or taking damage. This is likely because he has no voice effects. He also appears more 3D when metal. In Super Smash Bros. Brawl, however, Mr. Game & Watch will make clanking noises while moving in metal form. While Mr. Game & Watch keeps his silver outline in his Metal form in Super Smash Bros. Melee, his outline becomes black in Metal form in Super Smash Bros. Brawl. Mr. Game & Watch is the only Super Smash Bros. fighter who did not originate from any video game, being that he was a new character created for Super Smash Bros. Melee. On his fighter page on the mobile version of the official English Super Smash Bros. Ultimate website, Mr. Game & Watch's name was originally misspelled "Mr. Game & Watach". This mistake has since been corrected. ↑ Mysteries of the Subspace Emissary - Smash Bros. DOJO!!. Retrieved April 30, 2017. ↑ Super Smash Bros. Ultimate Is Being Criticized For “Racist Mr. Game & Watch”. My Nintendo News (November 6, 2018). Retrieved November 7, 2018. ↑ 26: Mr. Game & Watch – Super Smash Bros. Ultimate. YouTube. Retrieved June 30, 2018. This page was last edited on March 28, 2019, at 09:33.